Let’s face it, trying to wash your clothes while traveling is a hassle to say the least, but the pocket-sized Dolfi aims to change that. This device uses ultrasonic technology to convert a bucket or a sink anywhere in the world into a functional washing machine. Simply fill a sink with water, add dirty clothes, detergent, drop the device in, turn it on and watch as it emits powerful ultrasonic waves that travel through water, creating, high pressure bubbles. The bubbles then implode to generate strong jets of water that push the detergent through the fabric removing dirt and stains, with a complete cycle requiring just 30-minutes. Continue reading for five more clever gadgets that will make your life easier. 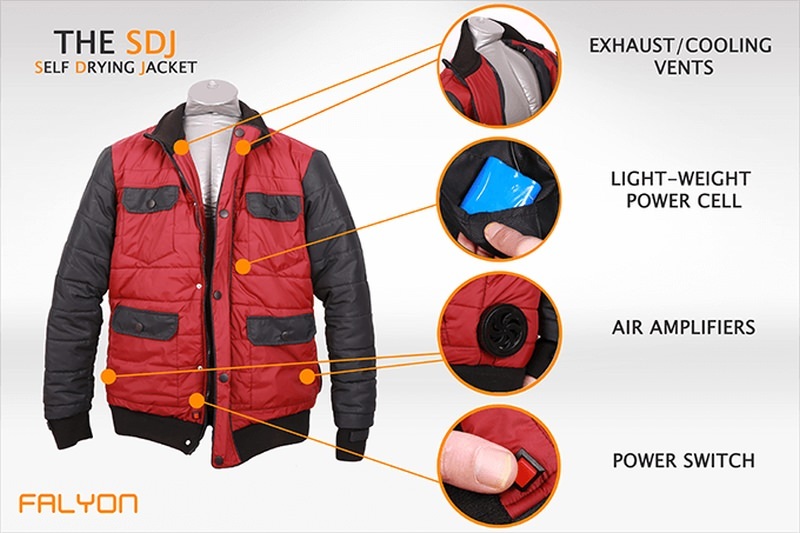 Inspired by the famous jacket from Back to the Future II, the SDJ-01 is a real self-drying jacket. In most situations, you can expect the jacket to dry in about 1-2 minutes, but if you try to recreate the hoverboard scene by jumping into a pond, the drying time will increase significantly. “The air amplifiers are capable of redirecting air with extreme high pressure and flow rates equal to or surpassing commercially available hairdryers. Despite their power, they are not exceptionally bulky or heavy, weighing about 4oz each. The air amplifiers function in the space between the jacket’s exterior and the inner lining. This serves to keep the high pressure air circulating in an enclosed space, maximizing the drying capability. This also ensures that the jacket dries from the inside out so the layers closest to your skin dry first,” said its creator. Called the DIGNO Rafre, this washable smartphone isn’t just a novelty, but powerful enough for daily use. Featuring a 5″ touchscreen display, Snapdragon 410 processor, 16GB of built-in storage, 2GB of RAM, 13MP rear camera, and a 2MP front camera. The body is completely sealed so you can wash it under the sink with soap and water. There aren’t even speakers because it relies on a Smart Sonic receiver that transmits sound through vibrations on the phone’s screen. Tired of how your sneakers look? Simply open up the Shiftwear app and change the design to your liking. 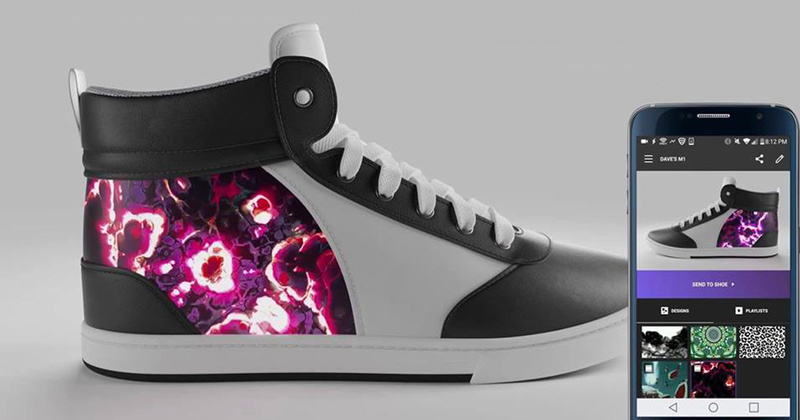 That’s right, these chameleon sneakers feature a flexible e-paper display that lets you add images or videos from a custom smartphone app. A timer lets you choose how long the visual shows last for, while users can also buy, sell, download and share designs. The base shoe comes in six different styles and a wide array of customizable colors. Aisa Mijeno, a Filipino architect and scientist, has developed a revolutionary lamp that runs on a glass of saltwater instead of batteries. 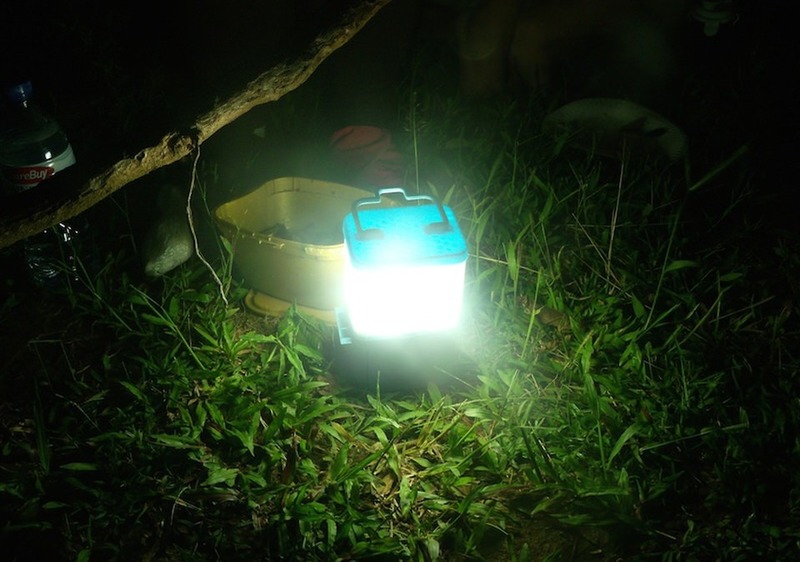 The SALt (Sustainable Alternative Lighting) lamp was created to “light up the rest of the Philippines sustainably,” by finding an environment-friendly alternative light source suitable for people in coastal areas. It can run for eight hours on just two tablespoons of salt and a glass of water. The idea behind it is the chemical conversion of energy, working on the scientific principle of the galvanic cell and making use of a harmless, non-toxic saline solution instead of hazardous electrolytes. Think of the “WALKCAR” as a “car in a bag,” or at least according to its inventor, Kuniako Saito. This laptop-sized device slightly resembles a skateboard in terms of functionality, and is reportedly very easy to use. Just stand on it to start, and step off, to stop. Want to change directions? Simply shift your weight towards the left or right, while uphill / downhill travel can be achieved by applying pressure forwards or backwards. Manufactured from aluminum and powered by lithium batteries, the WALKCAR comes in two models – indoor and outdoor – weighing between 4.4-6.6 pounds. On a full charge, expect about 7.4-miles of range, with a top speed of 6.2 miles per hour.